A new scheme of mini towers created by REX deals with fundamental problems in high-rise design: The lack of views and ventilation. In the densely packed cities of South Korea, where high-rises seem to outnumber trees, units with views of nature and fresh air aren’t just coveted, they’re fetishized. To offset the shortage, REX, the architecture firm run by Joshua Prince-Ramus (a disciple of Rem Koolhaas), has invented an entirely new type of residential structure: The “Freakishly thin” apartment tower, to quote Prince-Ramus. The model is effectively a standard apartment high-rise split lengthwise into four towers and separated by green space. So instead of each tower having four or five units per floor (the typical layout in Korean residential buildings), you’ve got one, which you squeeze inside the central core. This democratizes access to amenities for all the residents, ensuring that everyone has south-facing windows, cross-ventilation, and views onto a public park below. 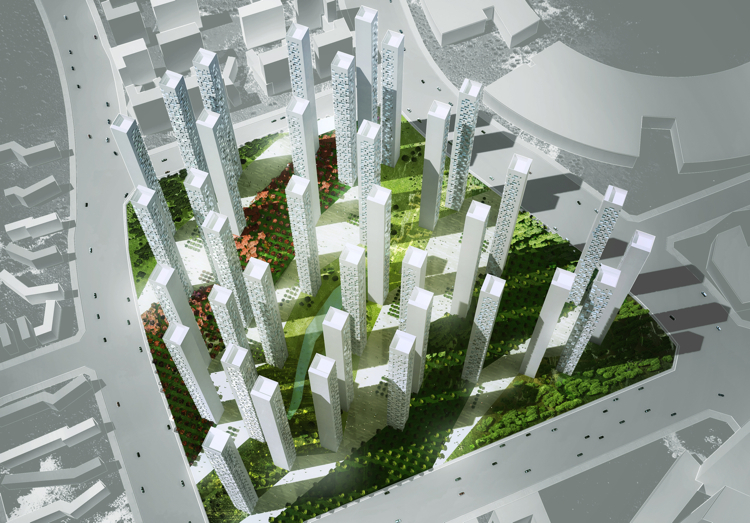 REX proposed the towers, called Block A4, in Songdo City, Incheon, a new urban center rising at a furious clip west of Seoul. The layout manages to be good business, too. Since each of the units fit inside the building’s core, you don’t have to build a separate facade; the core is the facade. That slashes construction time and costs.